Mt. 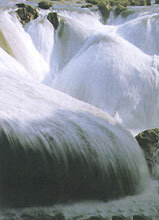 Fanjing is at the juncture of Jiankou, Yinjiang and Songtao counties in eastern part of Guizhou Province. The main peak of the Wuhng Range, Fanjing rises to 3,494 meters above sea level and is 23 kilometers from jiangkou County. It is not only one of the main nature reserves of the country but also has joined the Man and the Biosphere Program of UNESCO. The reserve has 300 square kilometers of pnmeval forests, precipitous peaks, mysterious valleys, waterfalls, springs and blossoming flowers. Since the reign of the Ming Emperor Wanli, it has been a venue of Buddhist activities and pilgrimages. The main scenic spots include Small Golden Crown and Huge Golden Crown. It is wonderful to witness sunrise from the top of Small Golden Crown, which is an 80-meter-tall boulder. The peak was split into two from the top to the bottom at two meters from the top. Legend has it that Sakyamuni and maitreya vied for possession of the peak. Neither would give it up and so they took the golden sword and cleaved the peak in two. The Chengen and Zhengguo temples were built on the two peaks. The two high points are connected by a flying bridge, known as the Beauty Bridge. Opposite them is the Huge Golden Crown. On it is the Fist-Shaped Rack or the Mushroom Rock. The rock is eight meters high and resembles a square pillar. The top is bigger than its bottom it is the symbol of Mt. Fanjing. Behind them are shale outcroppings that are reminiscent of 10,000 books. Among the shale outcroppings is a sightseeing terrace, standing out from the shale outcroppings. In addition there is Music-Listening Hall, the Stele Forest, and Cooling Pavilion. Near the entrance to the reserve accommodations are available at the Fanjing and Sleeping Dragon villas, as well as post and telecommunications facilities.